from Gartner found out, who took a closer look at the global smartphone sales in the current year, and then sorted them by the used operating system. In a global comparison Android devices lead the field thereby significantly and recorded a market share of 82.2% for itself – 2014 Android devices came incidentally, to 83.8%. Apple’s iOS operating system comes on a global market share of 14.6%. A slight increase over the 12.2% in 2014. Stuart Hall, head of the specialized app store statistics Company Appbots, has in the past analyzed the names, the screenshots, the descriptions and the country-availability of the most popular iPhone applications. Now Hall has done the same with the Icon-colors of the apps. Which colors dominates the App Store? How does the design of the free apps differ from the paid apps? Correlating selected Icon-colors with the chart positions in the App Store? Questions Hall answered in this blog entry and has two tips for app developers along the way: Who wants to stand out with a different design, set on a pink icon, who wants to classify in the establishment, select blue or red colors. Microsoft’s research department, the Microsoft Research Unit, presents in her home Blog the project MobileFusion and thus before a software-supported 3D scanner for the iPhone. The academic project of the Ph.D.-candidate Peter Ondruška does not require additional hardware to capture 3D data but relies exclusively on the recorded RGB values by the iPhone camera. The preliminary result may be admired in the embedded video. 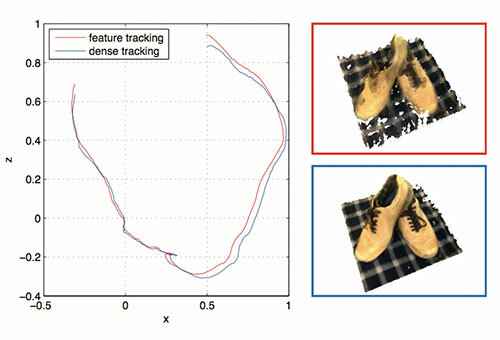 So the iPhone is able to calculate high-quality 3D representations of selected objects in real-time. The paper and all the background information on the project MobileFusion can be reviewed here via iculture.nl. The researchers say the system, called MobileFusion, is better than other methods for 3D scanning with a mobile device because it doesn’t need any extra hardware, or even an Internet connection, to work. That means scientists in remote locations or hikers deep in the woods can capture their surroundings using a cellphone, without a Wi-Fi connection. Be the first to comment on "Smartphone Numbers, App Icon Colors, MobileFusion"